– Pull out the pin. It will alarm with loud sound. – Insert pin back in to stop sound and use again. – The pin won't come out very easily. – The alarm sound is loud enough to draw attention for assistance. – Ideal for all ages: Students, Elderly, Kids, Women, Joggers, etc. It's also a security necessity for traveling, hiking, camping. 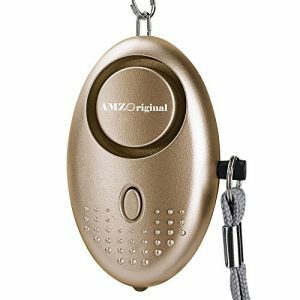 – This personal alarm keychain is mini-sized and portable, can be attached on backpack, ladies bag, belt loops, schoolbag, suitcases. It can be used for school bulling, elderly recourse, outdoor adventures and so on. Intense Ear-piercing noise would attract attention of people nearby and also deter the attackers or intruders. Security Necessity for you and your families' personal safety! 1. The 135 DB alarm is extremely loud, please do not put by your ears. 2. When the alarm sound goes low, please remove screws from back cover and replace new batteries. Super loud 136dB strident panic alarm and disguised as a bag decoration. Convenient keychain design is perfect along with house keys and car keys. Bright LED light suitable for illuminating a dark walkway or finding a keyhole. Four LR45 batteries included in package and replaceable for practical usage. High quality products and 31 day money back guarantee for your satisfaction.